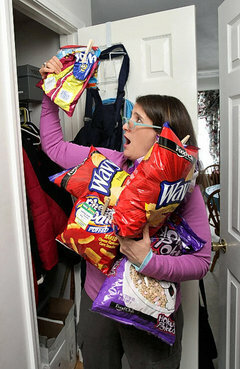 I took a spare hour and decided to clean out my pantry. It’s a walk in pantry, and to be totally honest, it gets to be pretty messy. Between my husband, myself and the grandchildren, things get sort of tossed in there on a shelf. So, about once every 3 to 4 months, I muck it out and throw things away. There are always half-eaten boxes of cereal that are stale and need to go; chips that have long since given up hope of accompanying a pastrami sandwich, and various bags and boxes of things I have picked up at the market that need to be put on the appropriate shelf with like items. I am always amazed at the number of empty boxes in there! Does anyone else ever have that issue? How hard is it to throw the empty box away? It’s like leaving an empty milk carton in the refrigerator. Unfortunately, the neatness will last about 2 weeks, and then it is chaos again. In cleaning out the pantry today, I threw out 4 boxes of half-eaten crackers. There were a few varieties, and I think they were left over from the Christmas holiday when all the grandkids were here. Cheese, meats, crackers and dips are a fun thing to throw out on a tray when they are watching a movie or playing Let’s Dance or something. Unfortunately, they never finish a box. Looking at the ingredients, I can see why. Most of it I can’t pronounce, and it’s no wonder they aren’t a favorite. So, I took the remains out to the chickens, who were equally less than thrilled, and finished the cleaning. 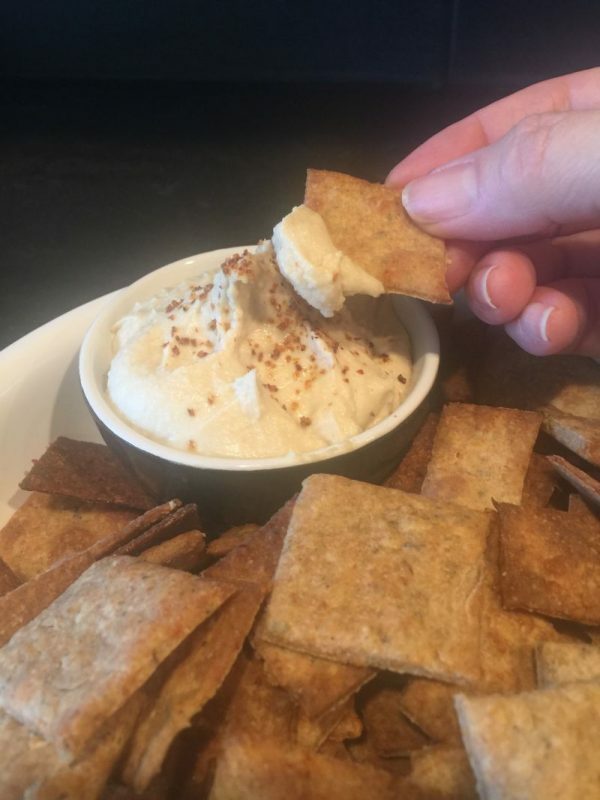 Wouldn’t you know it, right after I finished all that, I got a hankering for hummus and crackers. Thankfully, I know how to make them, but haven’t done so in so long it completely slipped my mind! When it came to me, I remembered how quick and easy they are, and how amazing…so I grabbed my camera and got to work so I could share it with you! You are only going to need a blender or a food processor. 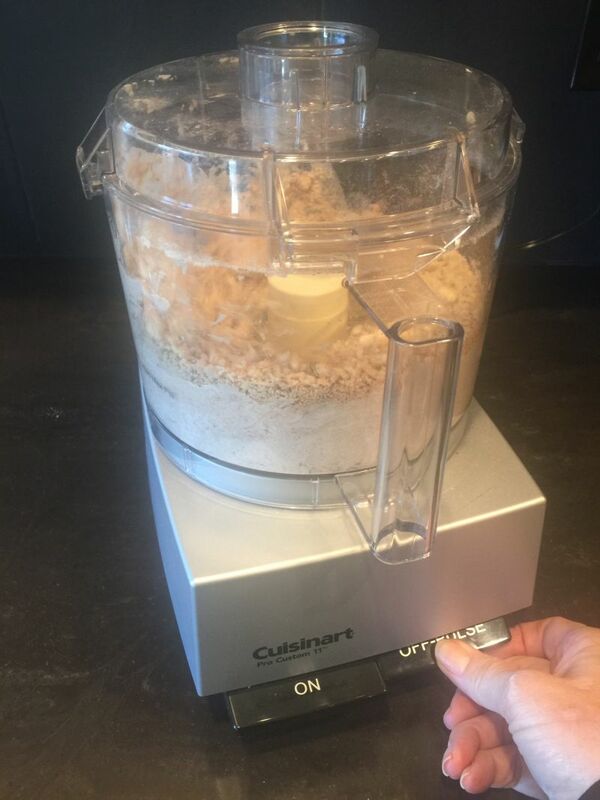 I think if you have a kneader attachment on your stand up mixer, it will work as well, but honestly, I haven’t tried that since I use my Cuisinart. There are many varieties that you can make, and maybe we will do some of those later. 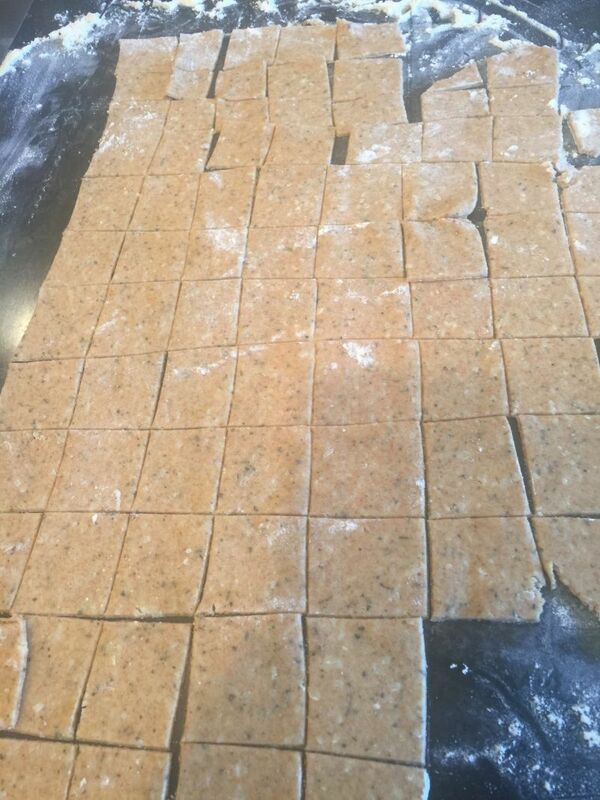 Today it is Parmesan Herb crackers, because I had all the ingredients already in the kitchen, and you are going to love them~! The whole process, including prep and cooking time, was only 20-25 minutes. Preheat the oven to 375 degrees. Put all the ingredients, except the coarse sea salt, in the food processor and pulse until you get a ball of dough. If it isn’t sticking together quite enough to form a ball, add a teaspoon of heavy whipping cream, one teaspoon at a time until it does. This will definitely need to be done if you use whole wheat flour like I do. With white flour, the dough seems to stick together pretty easily. I grind my own wheat, so I choose to use fresh whole wheat flour whenever I can. Both ways are absolutely delicious, so be sure and try both! Just remember a little more cream will be needed with the whole wheat variety. 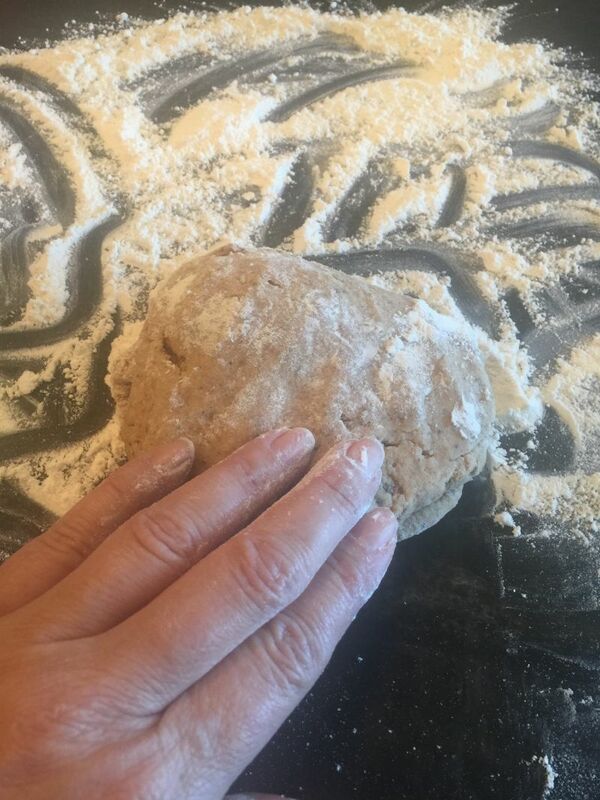 After the dough forms a ball in the food processor, remove it and place on a floured surface. Knead it a few times and then roll out to 1/4 to 1/8 inch. Don’t worry about the ragged edges, because you will trim those off and re-roll them. 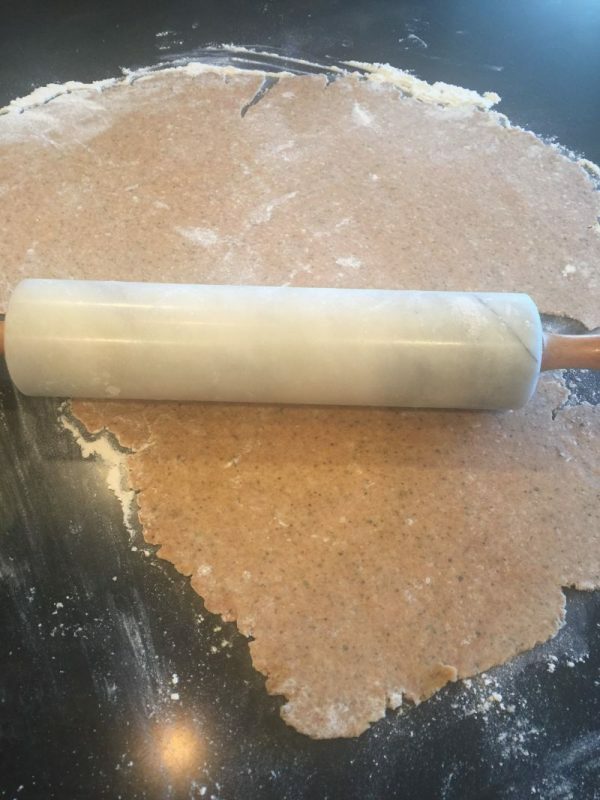 After you have rolled it out, use a knife to cut the dough in long strips, and then cut crossways to make a square-ish cracker. I use a little tool from Wilton, because it doesn’t scratch my counters, and it comes with 3 blades that offer me a wiggly edge to the cracker if I want. You can get it in the cake aisle at any store that carries Wilton Cake Decorating supplies. Use parchment, or just lightly spray a cookie sheet with non-stick spray. Lift the crackers with a spatula and place on the cookie sheet. If you like added salt, sprinkle them lightly with coarse sea salt before you put them in the oven. 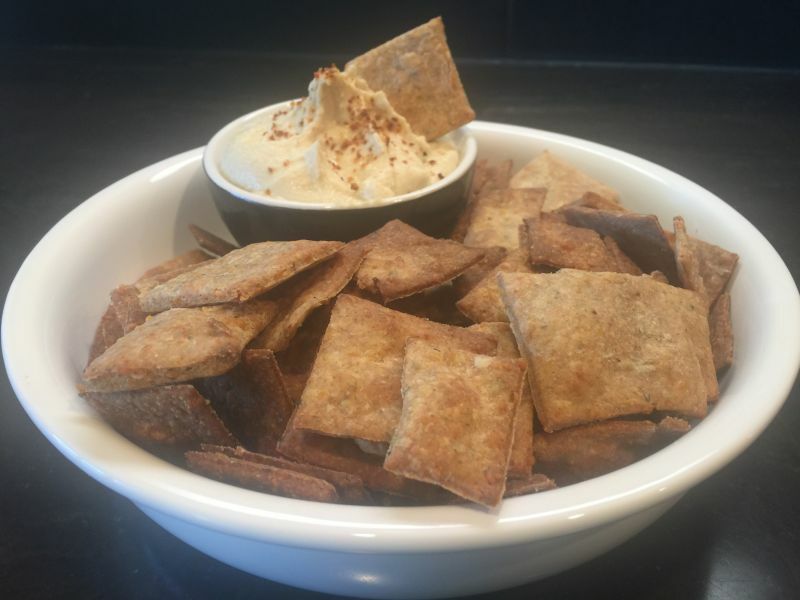 Additionally, the whole wheat crackers will cook darker than the white flour variety. They cook quickly, so watch them closely. They take 7-10 minutes in a 375-degree oven. These are a wonderful accompaniment to soups or put them out with dips. I especially like them with freshly made hummus. 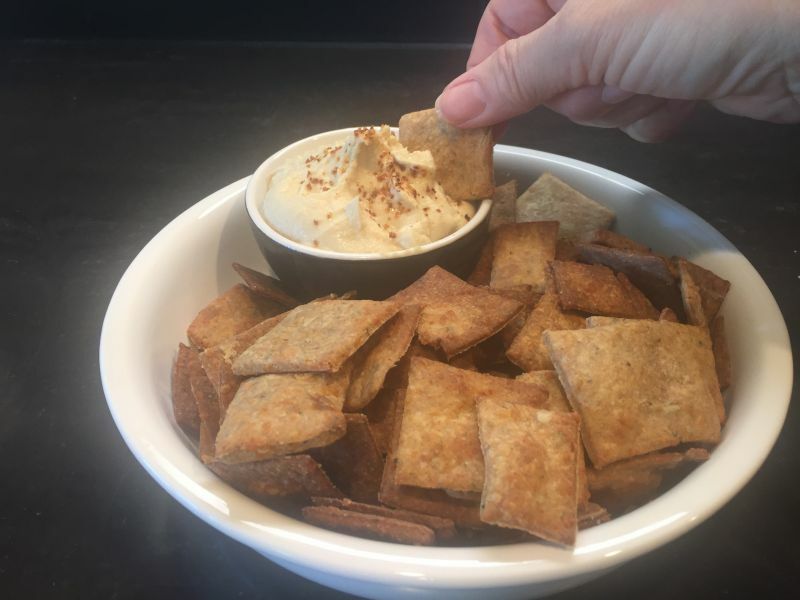 Thankfully, they are so quick and easy to make, you won’t mind whipping up a batch before you sit down to watch a chick flick with your sweetie. With munchies this good, he will probably last the whole movie! The lack of appeal on the nose was not reflected in its taste. The wine had a medium level of acidity. 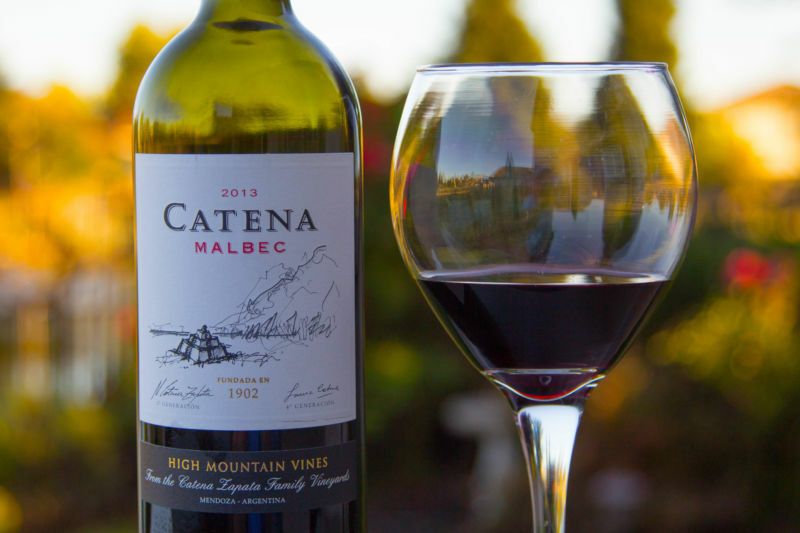 Soft fruits, with a heavy accent on plums and a hint of spice, gave way to a rich and fruity aftertaste with a slight earthiness. The tannins were well-balanced. I think this combination of flavors will be a perfect complement to the crackers and hummus.